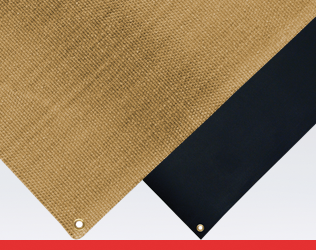 When you invest in a fire blanket you need absolute peace of mind in its ability to perform. That’s why you should look no further than Jactone’s Premium Range of fire blankets. Fully certified and with an unblemished safety record it’s quite simply the most reliable and safest fire blanket available. 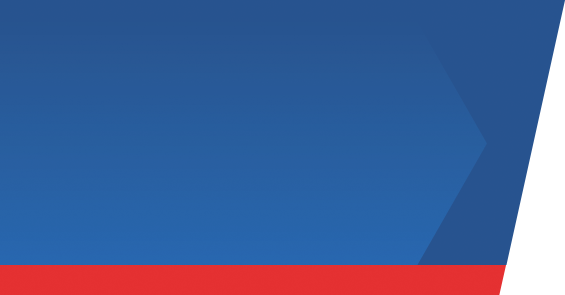 We also have a range of multi purpose welding drapes and curtains and a wide range of both standard extinguisher covers and bespoke covers manufactured to your exact requirements. Because we manufacture our products in our purpose built facility, not only do we provide a highly flexible and responsive service, we also have a robust quality management system to ensure we consistently produce quality products. If there’s something you’d like to know, simply call us on 01902 357777 and we’ll be happy to help. Our Premium Range Fire Blankets are made in our UK factory. They are market leading in performance with a 3-ply material construction. 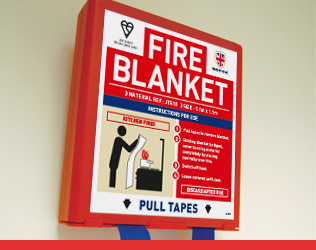 All of our Fire Blankets are Kitemark certified to BS EN 1869:1997. Welding drapes and curtains are perfect for environments where welding, gas cutting and grinding operations are taking place. A choice of two highly effective fabrics, NG200 and GPF1300. 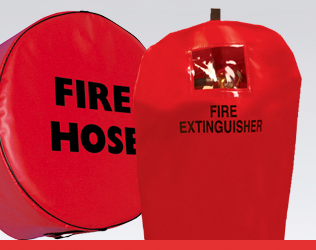 Available in a range of sizes..
We offer a range of equipment covers for general protection of fire extinguishers and wheeled units. Available in both premium and basic finishes, they are colour coded and are also offered in bespoke sizes.